Me Before You is not quite your average romantic drama given that the leading man is a quadriplegic. Which is only unusual in that there aren't too many films, if any, that spring to mind, where either leading character is completely dependant on others just to get through their day. Based on the book of the same name by Jojo Moyes. 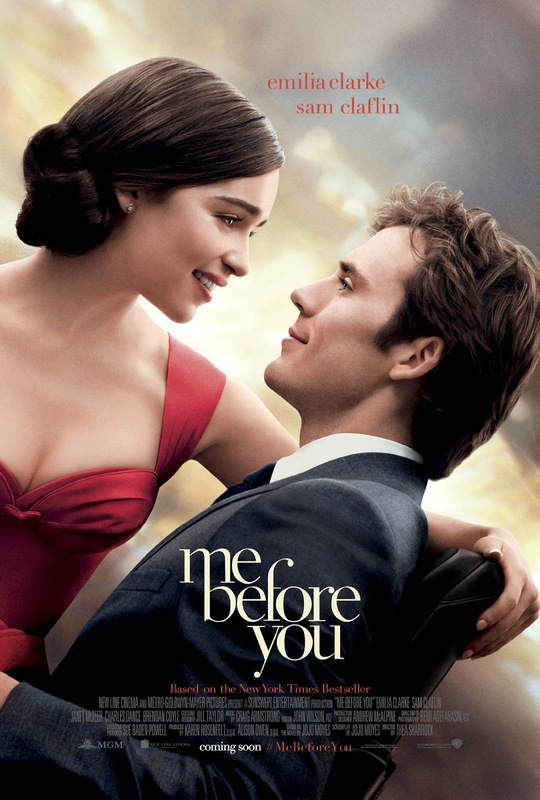 Me Before You sees former cafe waitress, Lou Clark (Emilia Clarke) hired to look after Will Traynor (Sam Claflin), who used to have the ultimate carefree and successful life before an unfortunate accident that left him a quadriplegic. Initially, Will proves to be a very difficult person to assist but, predictably, their relationship improves and even blossoms into something beyond the carer/client dynamic. However a dark cloud does begin to loom over the relationship that proves confronting to everyone involved. Me Before You may be challenging to some viewers given the issues raised (which I'm not spoiling here so you can find out along with Lou) but I think, overall. it deals with things very well, representing various points of view without saying any are particularly right or wrong. You will no doubt find this film to be heartbreaking (as any good romantic drama should be) but it also contains quite a bit of humor and is ultimately uplifting more than it is on the sad side. Emilia Clarke really nails her role with one of the most expressive, heart on her sleeve face I've ever seen. You're never in doubt about what she's feeling at any given moment. Sam Claflin is entirely believable as Will Traynor, also managing to convey clearly a whole range of emotions just through his facial expressions. For example, you really feel his frustration and humiliation when his chair becomes stuck in some mud at the races, even though he barely says an angry word. If the central issue of this film has been spoiled for you in other reviews, don't let that put you off. Particularly if you have strong views against the issue. It's a good story, with a very believable, relationship, that is a lot of fun to watch unfold. The film is not pushing any particular point of view, it's simply addressing a reality of the modern world and how various people approach it. Romantic dramas aren't really my kind of film but I do appreciate a good story with interesting characters. If a film can deliver that I'm happy. Me Before You does just that. I was thinking of going to see this film. Wouldn't have thought it was your type with all the Sci-Fi's etc, but I took note of your last comment. Will have to see when it is on. Didn't get to see the other one with Meryl Streep about the singer, as with it being out for a bit, the sessions were reduced to 10am.